This is PLC Program for fan control unit system for industry. There are three fans in a system. During the system running two fans must be running out of three fans. 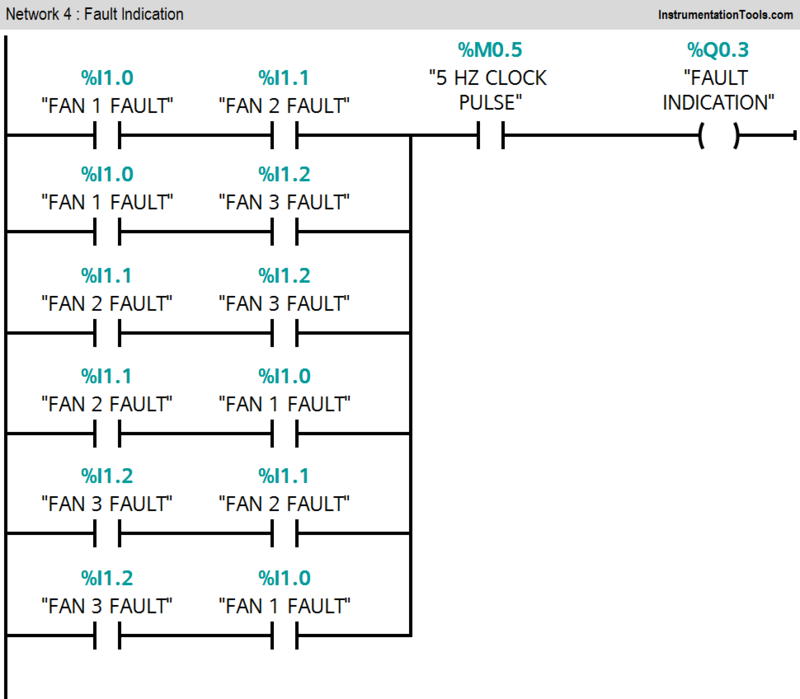 Implement the logic for fan control unit in PLC using ladder diagram programming language. We will use PLC S7-300 for this application. During system running any two fans out of three must be running. To start any two fans – say fan 2 and fan 3 – individual start & stop buttons are provided for each. Suppose fan 2 and fan 3 are running and one of them becomes faulty then fan 1 should be ON automatically i.e. at any given point of time two fans should be running. If there is a fault with any two fans then incoming supply to the system should be switched OFF automatically. The ‘ON’ status of the fans and also the status of main supply should be indicated by corresponding LED. If there is fault with more than one fan, indicate it as fault status with 5Hz flashing of LED. Fault with one fan or no fault with fan should be indicated by steady light on fault Status LED. For this application we used S7-300 PLC and TIA portal software for programming. We used latching circuit for cycle ON (M0.0) coil. It can be started by pressing START PB (I0.0) and stop by pressing STOP PB (I0.1). Main switch (I2.0) must be ON. When cycle is ON (M0.0) and fan 2 and fan3 faults are not present, fan2 (Q0.1) and fan 3(Q0.2) will be ON. Either Fan 2 or Fan 3 is faulty, fan 1 will be activated (Q.0). In system if any two fans out of three are faulty, fault indication lamp (Q0.3) will begin flickering with 5HZ frequency. 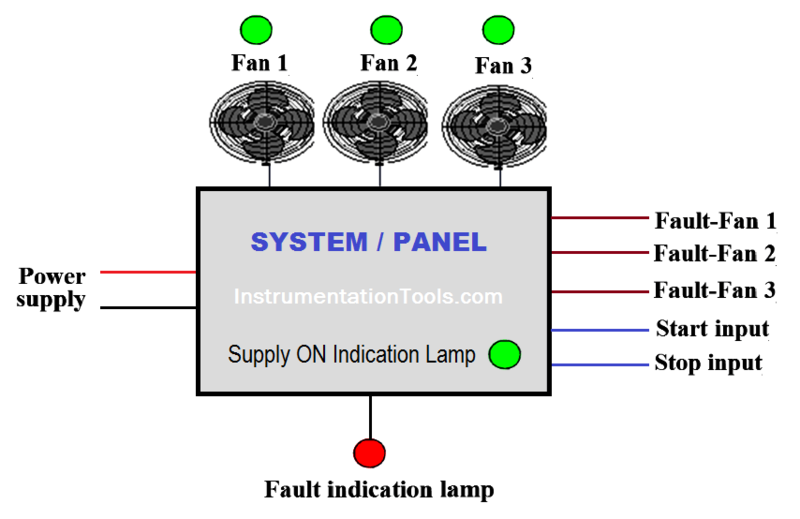 Indication lamps for fan 1, fan 2 and fan 3.Lamp will be activated according to fault signal. When main switch is ON (I2.0), main supply ON indication lamp (Q0.7) will be ON. Note :- Above application may be different from actual application. This example is only for explanation purpose only. We can implement this logic in other PLC also. This is the simple concept of fan control unit used in industry, we can use this concept in other examples also. All parameters considered in example are for explanation purpose only, parameters may be different in actual applications. Also all interlocks are not considered in the application. What is Ladder Diagram Programming ? Sir can you suggest any simulator software for s7 300 plc. So that young aspirants can practice all these helpful program sections.